Have you ever wondered what kind of weather equipment we use for observations? What kind you can get? Suppose you were looking on-line to buy weather stations, accessories for professional weather stations, such as the Stevenson Screen shown here, or maybe one of the many types of home weather stations that have recently become available. If you're looking for supplemental information about these items and the instruments typically contained in each set-up, follow the article on this page and the links in each section. Also, clicking the blue text above will take you to an introduction to how weather equipment and software might be used in environmental regulatory compliance consulting and research. Here is a brief description of the more common instruments and supplies. You are probably already familiar with some of these. First of all, a barometer measures the atmospheric pressure. What is that? Air pressure is force from the air per unit area, given in units such as pounds per square inch. Every square inch. People who get barometric pressure headaches get a pretty good idea of which effects small pressure changes can create. Because every inch of their bodies is affected equally by these changes. Other pressure sensors, such as barometric pressure transducers, exhibit the same kind of sensitivity. Outdoor thermometers measure air temperature and give us numerical values in degrees. Everyone knows what temperature is, right? That is the degree of hotness or coldness you feel. Temperature recording weather equipment objectively stores these numbers for us. The information is ultimately kept in a computer database for later use. 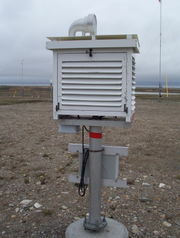 Examples of this type of weather equipment include dataloggers and computers. It's the amount of vaporized water in the air. The most well-known way of expressing humidity is by using relative humidity. Learn about other humidity-related quantities and their use in scientific contexts in this article. How do you measure Humidity? Meteorologists and supporting technicians use a hygrometer. A closely related instrument, known as a psychrometer humidity meter, carries out the same function . In this case, temperature is shown on two thermometers. One of which is kept wet and the other dry. Then we can compare the two, calculate and chart the dew point to use the data in our subsequent analyses. Wind moves objects around, and then we can use the motion to determine and track which way the air moves and how fast. We normally use things likes flags, airport wind socks and weather vanes. Research weather vanes and comparable kinetic motion indicators point the direction of air flow. Wind speed instruments are called anemometers. By putting these two values together (speed and direction), we obtain a vector quantity. What is that? Simply one that requires at least two inputs, speed and direction in this case. Wind data loggers record this information. Another category of weather instrument is rain gauges - How much rain (or snow) did we get last night? Find out what this number means. We call this Remote Sensing. Some devices let us look at weather conditions from far away. In preparing forecast information, weather services use these data sources along with figures from surface-based weather equipment. Radiosonde - A package of temperature and humidity recorders put together with a few other instruments. 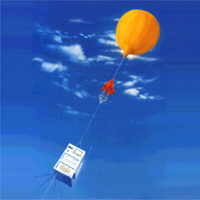 They are placed in a box with a transmitter and locator to send weather information back to earth by radio signals. We attach the package to a weather balloon, let it fly and record these parameters at various elevations and even hundreds of miles downwind. Weather Satellite - a space vehicle high above the earth. We equip satellites with many cameras for taking satellite photos of the clouds below. Some satellite gadgets can see inside the clouds. These are the only devices that give us information from outside of the atmosphere. Radar - (RAdio Detection And Ranging). An electric system for sending and receiving radio waves microwaves, actually to find things. The radar has been used for finding military vehicles and artillery, obstacles as well as storms and areas of precipitation. Doppler Weather Radar - A radar that can also tell which way things are moving and how fast. Very useful for finding speeding cars and preparing an advisory - a severe weather forecast which helps storm chasers pinpoint tornadoes, tornados and other strong winds. Pilots will also describe weather they encounter during their flights. The weather reports they view before takeoff cannot tell them everything. So when they see something unusual, they send pilot reports or PIREPs for short. Want to see some official observations, made using scientific and electronic weather equipment like the items listed above? Look at a METAR observation. This article tells you how to decode and read a METAR weather report. All these different kinds of weather equipment are enough to even make Bill Nye's head spin. Are you a weather equipment enthusiast? Please tell us a bit about your setup. Build your own website business. Receive a free course on how to do so here. Below, you will find some opportunities to make your own comments on this equipment. Where can we find whether we need equipment or instruments for home weather stations? Weather station equipment comes in practical and decorative forms.